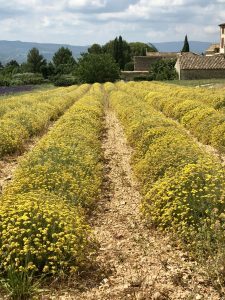 As a Certified Aromatherapist, one of my biggest dreams has been to visit farms and processing facilities in France. Last month that dream became a reality and was nothing short of amazing. I was very excited when asked to write about the trip, but have an overwhelming fear that I will run out of adjectives halfway through this post. The trip started in New Jersey with several days of fragrance training, and then off to Europe with Robert Bardsley, Plant Therapy’s Procurement Manager, in a quest to source the best quality essential oils and allow me to learn more about the processes. Our next destination was Bulgaria. Aside from the wonderful essential oils and extracts Bulgaria yields, I knew little about this beautiful country. The people were extremely friendly and seemed very committed to making us feel at home. Obviously, a big part of the culture there. The food is simple and delicious and the old villages were entrancing. I felt a strong emotional connection there. Maybe I really do have a gypsy soul. On the drive in from the Sofia airport, I was surprised by the many fields of sunflowers. They were like blankets spread over miles. It was breathtaking! 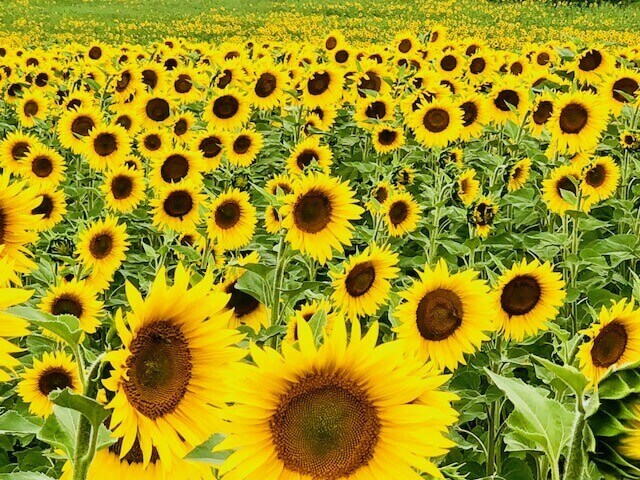 As it turns out, Bulgaria is one of the largest producers of Sunflower Oil in the world. 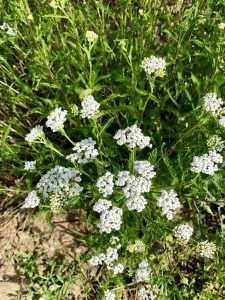 We visited several organic farms including Lavender, Blue Yarrow, German Chamomile and Rose. One of the highlights was getting to see Blue Yarrow harvested and distilled. Transforming clusters of tiny white flowers into the most beautiful blue essential oil – and in only a few hours. I was impressed by how efficient the operation was, the steps in place to keep the equipment in top shape, and also by the fact that there was virtually no waste. Once the distillation process is completed, the remaining plant material is composted and returned to the fields, and any remaining water is recycled. 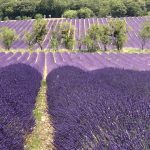 Obviously, I have used Lavender Essential Oil from Bulgaria many times, but experiencing the fields took it to another level. Rows and rows of billowing fragrant plants and the low buzzing of bees at work. I could have easily set up camp till after the harvest was complete. I was torn between the impulse to run – dancing through the rows, or just lying down right in the middle of it all. Many farms have bee hives just off to one side of the field. It not only helps with the pollination process but also results in some of the most fragrant, delicious honey you can ever imagine! One of the places we visited is called Rose Valley. Each year there is a week-long Rose Festival before the harvest. The Festival has been organized annually since 1903 in Kazanlak. 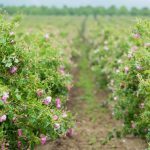 It celebrates the deep connection to the Rosa Damascena – the Bulgarian oil-bearing rose and all the gifts it has blessed the Rose Valley with for centuries. Unfortunately, we missed the festival, but I have added it to my bucket list. While we were there I was presented with a gift of Rose Concrete. It is fragrant and lovely, and I’m sure is worth about a month’s worth of groceries! Solvent extraction uses hydrocarbons (such as hexane) to extract the volatile compounds without degrading them in the process. Once the solvent is removed, the resulting product is known as a concrete. Further derivation results in an absolute. As sad (and admittedly tired) as I was when leaving Bulgaria, stepping off the plane in France was like a double shot of espresso. It was everything I had imagined and more. Charming villages, spectacular countrysides, mouthwatering cuisine, and oh – the fields of France . . . the fields . . . the fields . . . the fields. 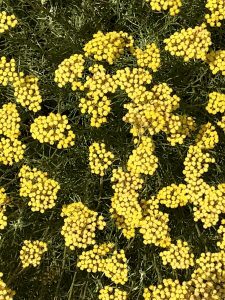 The fields of Helichrysum . 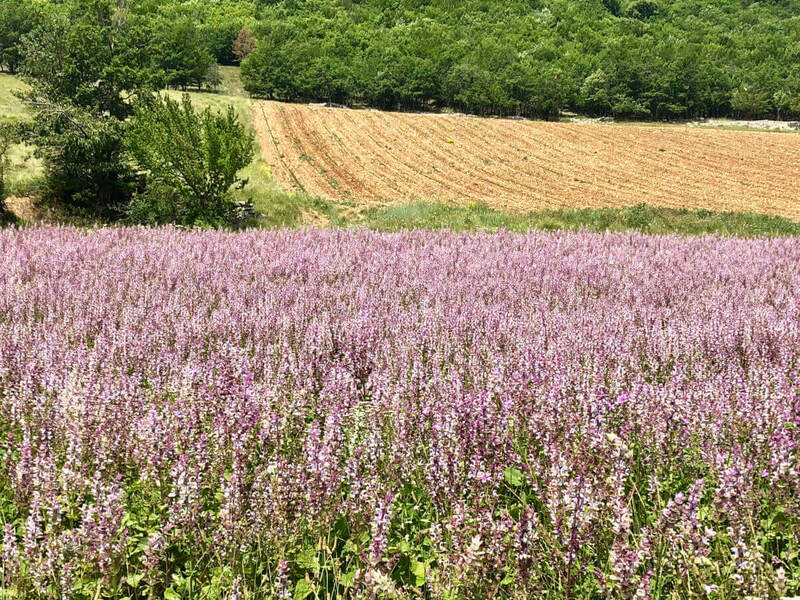 . .
the fields of Clary Sage . . .
the fields of lavender . . .
and a new love . . . Lavandin! I have used Lavandin many times with great success, but I gained such an appreciation for it while in France. 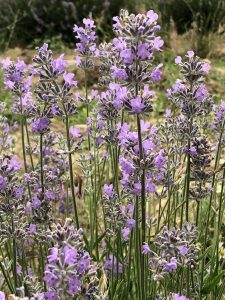 Now we know that Lavandin is a cross between regular Lavender (Lavandula angustifolia) and Spike Lavender (Lavandula latifolia), but it never registered with me that because it is a hybrid, it’s sterile – it has no seeds. The only means to reproduce them is by using cuttings. 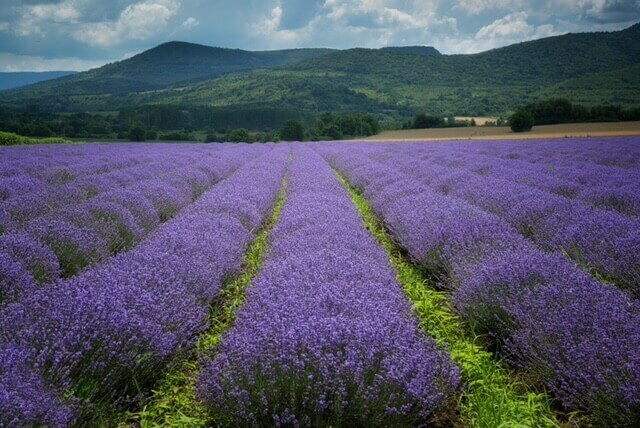 The good news is, Lavandin is tougher and more tolerant of growing conditions than Lavender. Lavandin plants are also larger and much deeper in color. They grow in stalks of three and the flower buds are quite close together. 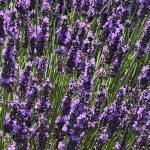 The plants generally produce about 50% more essential oil than regular Lavender. Lavandin boasts many of the same benefits as Lavender, but because of its camphor content, it is great for freshening up the home, in cleaning products, and to help with seasonal illnesses and allergies. Did I mention my new-found love for Lavandin! 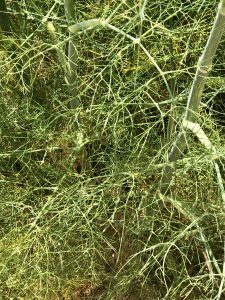 We also caught a glimpse of Fennel and Juniper Berry growing wild along the edge of a Lavender field. While in France we were able to visit the facilities of some of our existing suppliers. They graciously gave us tours and explained their processes, and we witnessed their best practices and state of the art equipment and automation. Not only did it increase my knowledge of these processes, but the appreciation of the time and effort that goes into achieving a high quality, pure product. 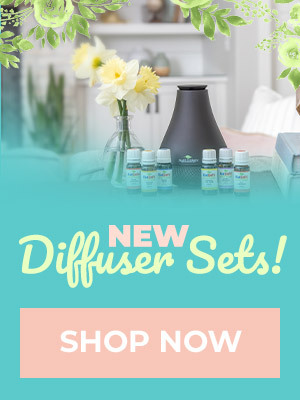 I don’t think I will ever look at an essential oil in the same way ever again. We were also able to pop into a perfumery and visit a perfume museum. The displays of bottles from many countries and the history is fascinating. Another big highlight for me was experiencing the many aromas. Some were very familiar, and others – well let’s just say I see some exciting OOTM’s in the future! Yes, it truly was a dream come true! It was an inspirational, soul nourishing, transformative experience, personally and professionally, that supports me in living my purpose. I am grateful for the opportunity to write this blog post and to share my journey with all of you. Wow! Beautiful photos! I am envious of your trip! Wow! I would love to visit those places as well! An education AND “scent”ually beautiful experience! Thanks for sharing! Me and my wife love to travel and are always looking for new places to go. This sounds like it would be a great time. 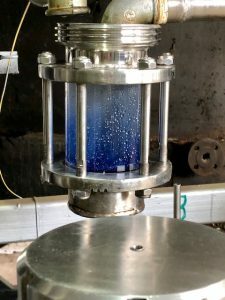 Do any of the distilleries offer tours to tourists or do you have to be in the oil industry to see this kind of stuff? I’m not sure! I know some do, but some do not. It’d be best to contact the distillery you’re interested in. Ooooh my. I have tears in my eyes. This sounded absolutely heavenly. Adding something like this to my bucket list!!! ¡Qué-WoW! What an amazing experience. Thanks for sharing. Great pics! What a great blog! Thank you so much for sharing! Those pictures are BEAUTIFUL! They soothe my soul just looking at them! i want to study aromatherapy too but i can’t smell very well. do you have any idea how i can regain my sense of smell? I’ll love to immerse in the fields of these flowers. the pictures are splendid. I always thought Lavendin is inferior to Lavender. I probably won’t enjoy Lavindin if it has camphor content. Thanks so much for sharing your amazing trip with us. The pictures are stunning! I learned a bit and enjoyed traveling across Europe with you! Thank you sharing your experience with us. The photos are so beautiful. After reading this, I now want to go visit Bulgaria. I hope you’ll have the opportunity to take another wonderful trip like this. Thank you for sharing your pictures and this information. So important to remember the resources that go into each bottle and drop of oil. Your pictures inspire me to want to take a trip to see for myself! All the pictures are so beautiful! I love that PT is always willing to bring customers along on their amazing journeys. We get to learn so much along the way. Thank you for sharing your trip! 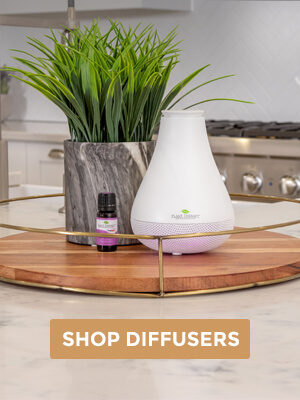 I’m new to essential oils and I’m so excited to start this journey. I watched the live video on this and it gave me a lot of insight. Thank you! Sometimes I wonder what it takes to be an aromatherapist! Thank you for sharing your pictures! They are so beautiful. I love that this was featured on a live video as well. 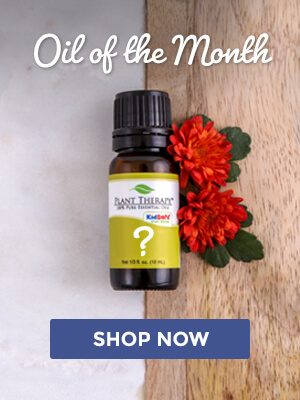 Great idea to highlight how the oils are grown, procured, manufactured and everything else! How lucky are you Lori. Can’t wait to see your next world adventures. Thank you so much for sharing! I saw the live video where you talked about the trip and have been looking forward to the blog post. This trip sounds like it was so much fun and such a great time! Thanks for sharing your trip and those wonderful pictures with us. It really makes us to appreciate tithe effort which goes into one tiny drop. This is amazing! Thank you for sharing your journey! Sounds like a wonderful journey, thank you for sharing. You look like you had a great time. Wow, Lori! What an amazing trip! Thank you for sharing your experiences and beautiful photos with us! The joy is written all over your face! Now Bulgaria is definitely on my bucket list! This is so inspiring, thank you Lori for sharing your experience with us. You write so well, I feel so blessed already just reading this article and looking at all the beautiful pictures, Fields, Fields, and more Fields of Flowers! If Plant Therapy organize a trip like this to any farm in the world, it will be fully booked each time! Thx so much for ur post! I would love to go on a trip like yours!!!!!!! Its on my bucket list to go see some of these fields they’re so beautiful. I cannot wait to see the video when you get it ready of your trip. Thank you for all y’all do to make sure that your customers have the best!!! Thank you so much for sharing your trip with us. I can only imagine the scents you smelled and how wonderful it was to see where all the oils we use and depend on come from. Thank you again! What an incredible trip you had! Thank you for sharing it with us. This makes me want to go visit my own local lavendar farm. What a great post! The photos are amazing and a dream for me! I hope you get the opportunity to do this again and be able to share with us! SO excited for upcoming OOTM!!!!! Hi Lori, thank you for sharing this with us. Your video with Retha was my favorite by far. Such beautiful pictures and your excitement was contagious! Wow! Your trip was a dream come true. Beautiful vivid pictures and a great article. Being able to see the plants and processing put a whole new perspective on the oils sold by PT, and the care taken to ensure their products are of the highest quality. What a great adventure. I’ve always wanted to travel abroad to different distilleries in different countries. What a neat opportunity. Love it! Thank you Lori for sharing your adventure!!! Beautiful pictures! I’m not jealous. I’m not jealous. I’m not jealous. I loved seeing all the photos and hearing about your trip on the live video. It was so educating and so beautiful. What an incredible trip! Thank you for sharing! Thank you for sharing this wonderful commentary on your visit to Bulgaria and France, and the pictures…! 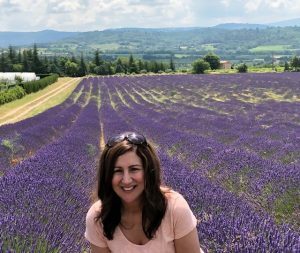 The lavender and lavendin fields are beyond words. So beautiful. It really inspires me to consider visiting a distillery at some point, even if it is within the United States. This would have been the trip of a lifetime. What an amazing experience! Your video with Retha talking about your trip was so enlightening! It really helps to connect us to the plants that give us such great EOs. Thanks for sharing your trip with us! So wonderful to see where the oils are coming from! I was happy that you made and video and a blog post sharing this experience! I so enjoyed reading this blog and hearing you talk about your trip with Retha. 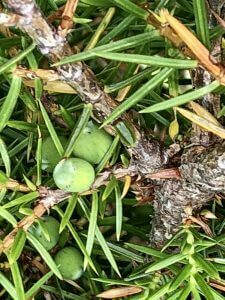 Everyone should head this blog… very educational to see the plants that our amazing oils come from. Thank you!! Amazing, thank you for sharing your vibrant pictures and equally exciting experiences! Such beautiful photos! Thank you for sharing. Your narrative is vivid too.. I could almost immerse myself in the fields. Great to know the origin of the oils we use. Wow, it looks like that was one amazing and delicious smelling trip 🙂 I would’ve been too afraid of the bees to run or lay down in those lavender fields 🙂 I can’t wait to see what future OOTM ideas you have! Thanks for sharing the beautiful pictures from your trip with us! We’ve just planted 15 lavender plants in our new home’s landscape. They smell wonderful and are so beautiful. I can’t wait for them to grow and bit more & fill in like the amazing photographs you shared above. Love this so much. Beautiful photos. I have been looking so forward to this post Lori! The live video with Retha was wonderful. I am living vicariously through your trip…seeing all the wonderful flower fields and smelling sweet aromas! Thank you so much for sharing your experiences! Thanks for that great blog post! I love the photos and your descriptions of the fields of flowers and what you saw. I would love to see some of the essential oil farms / processing places in Australia as many oils are native to Australia! I am so jealous! Bulgaria is now on my bucket list. Thank you for sharing your trip with us! Lavender honey sounds like it would be amazing, and I’m excited to know what OOTM ideas you have up your sleeve!